Wondering how much rent to charge? get a full report on your property for only $19.95. Get your complete report for $19.95 now! 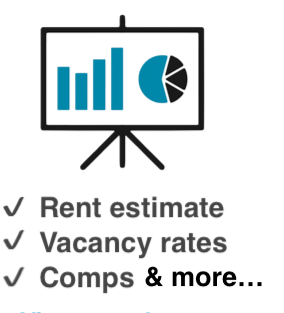 Property Reports provide a complete analysis of specific properties, including estimated rental rates, rental trends, area vacancy rates, rental market strength indicators, comps for nearby rentals and other vital intelligence. With a rent estimate which is inline with what the market bears you will avoid charging too little and maximize your rent income. With a rent estimate which is inline with what the market bears you will avoid charging too much, rent faster and stop vacancy losses. The Rental Property Report is filled with cost-effective, actionable, location sensitive data which you will receive in minutes with a click of a button for only $19.95. Once attained reports will be stored online for your future reference. Data for reports is updated on a monthly basis, so you can be sure that you are receiving current information. Reports are in PDF format so you can digitally share and print them with ease. The report provides an in-depth comparison of your property and other properties in the area that gives you valuable insight for discerning investment property analysis. Reports are supported by an extensive database of real estate investment properties across the U.S. The complete Rental Market Report costs $14.95 and we accept major credit cards as a form of payment. The report is ready within several minutes and will be made available to you in a PDF format on your iManageRent dashboard. The complete report will be saved and is accessible to you under the “Stored Documents” section of the unit on your dashboard.